Perfect. 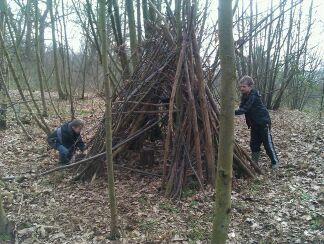 Nothing better than a woodland den! that’s some serious building going on! Brilliant. Looks like lots of fun! Barricading an errant child in? A little more advanced than ‘the naughty step’ but I’ll go with it. Great capture. That looks like a whole lot of fun to me. What a great construction! Now THAT looks like my kind of fun!! That looks like an amazing adventure! !